Get the TARDIS Newsroom - Doctor Who News widget and many other great free widgets at Widgetbox! Absolutely Doctor Who Designs// Doctor Who__A Good Man Goes To War - 4th June! SARAH-JANE.tv || A news resource for the Doctor Who spin-off "The Sarah Jane Adventures"
Disclaimer - This is a non-profit, fan-run site with no connection to the BBC or any other organisation. Doctor Who, Torchwood and The Sarah Jane Adventures are all Copyright (C) to the BBC. No infringement of this is intended. All images, including banners which may have been edited are all Copyright (C) to the BBC or their respective owners. Doctor Who Magazine has won a prestigious Eagle Award for Favourite British Comicbook (Colour). The awards, which acknowledge comic books and their creators, were held yesterday at London's MCM Expo. DWM fought off competition from 2000 AD, CLiNT Magazine, Judge Dredd the Megazine and STRIP Magazine. The magazine's official Twitter account thanked voters and posted a picture of the trophy (above). 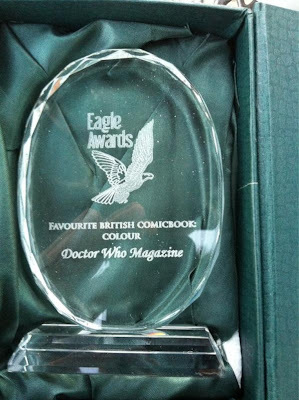 @DWMtweets: We're delighted to announce that Doctor Who Magazine has won the Eagle Award for 'Best British Comicbook Colour'. Thanks so much for voting! Steven Moffat congratulated the win: "Punching the air @TomSpilsbury and team with an Eagle Award for Doctor Who Magazine! AMAZING!" Doctor Who Magazine editor Tom Spilsbury expressed his excitement on winning, posting: "OH MY GOD, WE WON!!!"